First Line: Leaning his shoulder against the dark basement wall, Jean-Baptiste Adamsberg stood contemplating the enormous central heating boiler which had suddenly stopped working, two days before. Commissaire Jean-Baptiste Adamsberg of the French National Police has spent most of his career as a type of Lone Ranger, always maintaining an emotional detachment from colleagues and suspects alike. This detachment can also be seen in one of his favorite ways to spend some down time: sitting in an Irish pub in Paris where he cannot speak a word of the language. There he can enjoy both the feeling of companionship and his solitude. Adamsberg's newest case will force him to face a personal demon from thirty years in his past-- a serial killer who framed Adamsberg's brother for murder, and who successfully avoided prosecution for that and many other murders. This killer has supposedly been dead for over fifteen years, but when the Commissaire comes across a corpse that bears his tell-tale "signature," he knows the man has returned and is killing again. Trying to convince anyone of this is impossible, and his clandestine investigation is interrupted by a mandatory forensics course in Ottawa, Canada. Once back in Paris, Adamsberg finds himself framed for murder. Will this French Lone Ranger be able to prove his innocence? I've enjoyed the other three books I've read in this series, but I always felt that Jean-Baptiste Adamsberg was maintaining a distance between us. With Wash This Blood Clean from My Hand, this distance vanished, and I am well and truly hooked. Vargas excels in mixing various styles, and she continues to do so here. There's a light comic touch throughout the book combined with much darker themes. What's new to the mix is the fact that her main character has to look deep inside himself during this case, and this adds just the right amount of psychology to the book. There is something about a story in which the hero knows himself to be right yet still finds himself fighting against tremendous odds. How is he going to succeed? Where is he going to find trustworthy people to help him? The killer he's been following for so long is highly intelligent and quite adept at covering his tracks. Adamsberg has to change his methods in order to bring him to justice, and changing those methods is not easy. His help comes from some very unlikely sources: "These last few days, my life has been in the hands of magical women. They've been tossing me from one to another, and every time they save me from falling into the abyss." A large part of the joy in reading this book is becoming acquainted with these magical women, and I refuse to tell you about them because you need to discover them for yourselves. 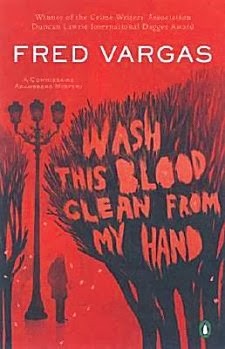 Wash This Blood Clean from My Hand is one of those wonderful instances in which plot, character, and writing combine in a story that grabs hold and doesn't let go. It's one of my best reads this year and makes me wonder why I've fallen behind in reading Fred Vargas's books. Cathy - Oh, I love Fred Vargas' work. I love the characters, the wit, and the almost surreal ways in which the plots work. The writing is great too. What a treat to read a Vargas review here :-). It's been way too long between books for me, Margot! Well, we definitely agree here. I like all of Commissaire Adamsberg's investigations, the settings, characters, plots -- and, of course, the wit. Fred Vargas ia a favorite author of mine, up there in the top few. I will follow her quirky, creative mind anywhere -- and I've never been disapppointed. If a reader is looking for a formulaic read, this is not the book for you, nor are any of her books. But if one wants to venture out and see the world, experience and learn something new and enjoy a very imaginative plot -- and solution -- then be sure to read this book. Also, this book has one of the wittiest bathroom scenes ever written. So, for the holidays, why not treat a reader-friend or yourself to a Vargas book? Then curl up in an armchair, get tea and snacks and read away. Yes, Cathy, but isn't it fun? If I can loan or give a friend a wonderful reading experience, which they will discuss with others and remember fondly, why not? Could you please share where we can download this as an ebook? After checking around, it looks as though the only eBook versions of Vargas's books start with the last two published in English: An Uncertain Place and The Ghost Riders of Ordebec. I would imagine that the earlier books will be published in eBook format sometime in the future.